Reread. Love this series. I forgot how long it was though. It took quite some to read it. The writing and plot of this series is very good. I still love it, after all these years. I haven't liked anything from J.K. Rowling since this series though, but I guess we'll always have Harry Potter. If you haven't read it? Get of your high horse and read it this instant! Now! go! It's better than the movies (although they really aren't bad voor movies that were based on a book). 1/5/2018 - I have read this book so many times, but this time was just so emotional for me for some reason. I kept having to force myself to read it because I got sad every time I thought about finishing it, even though I know I can always read it again any time I want. And this was also the first, of every time I've ever read it (I've lost count btw), that I've actually been brought to tears, and not just once either. 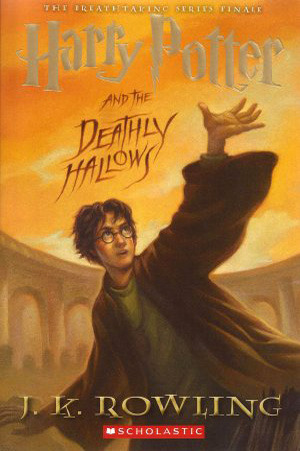 The last book of the Harry Potter series provides a good conclusion. Any remaining questions seem unimportant. Having grown up with these books, I remember my feelings as they came out. Though I'm 8 years younger than Harry, this book was published only 1 year after I graduated high school. I felt a kinship towards these novels, now reading them as an adult, I am only saddened by them and wholly disappointed in their TERF authorship. I don't recommend the series based on their authorship. What I do recommend is to expand your reading spectrum. Seek out books by and about those within the LGBTQIA+ communities. Seek out books by and about people who are like you, people who are different from you. Harry Potter was a good series, but art should not be separated from artist. So sad to see this end! Will have to reread this series! Camping, moping, and being depressed. The end is good, though. This book is kind of rough to get through.